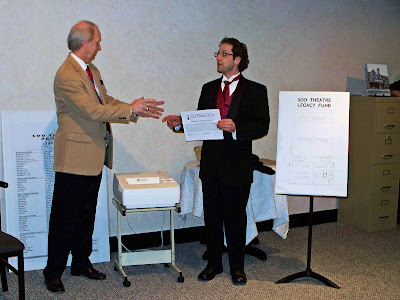 Above, David Firack (President/CEO of Old Mission Bank) eagerly reaches for the commercial loan contract in the hand of Jack Bradway, Executive Director of Soo Theatre Project. Moments later, Firack ceremonially shreds the now-paid-in-full loan contract. Photo courtesy of Tom Robinson. Wednesday night marked a milestone and new beginning for one local business. Soo Theatre Project hosted many guests as it celebrated paying off the loan from Old Mission Bank that made saving the historic downtown theatre possible. Simultaneously, Soo Theatre Project unveiled ambitious plans for the future. Since reopening the doors three years ago, Soo Theatre Project has thrived through a mix of arts instruction and live summer performances. Indeed, support for the endeavor has been overwhelming. Arts classes are bursting at the seams, while the stage is in high demand. Maybe the most interesting part of this story is that only a portion of the Soo Theatre building has been renovated. The rest of the building is unfinished, and in fact lacks heat. Here is where ambitious plans for the future come into play. On Wednesday night, Soo Theatre Project announced that it is going on a $1 million capital campaign – The Legacy Fund. Money raised will be used to turn the second floor of the building into 3,000 square feet of dance and music studio space; build restrooms and install an elevator; hang lights and curtains in the auditorium; and most importantly, heat the 80% of the building that is the same temperature as outside. In short, The Legacy Fund will facilitate the year-round use of the entire Soo Theatre. Along with unveiling these ambitious plans, a special announcement was made at the Wednesday night gathering. To spur a successful Legacy Fund campaign, a $50,000 challenge was made by one individual prior to Wednesday, and has already been met with $25,000 in matching gifts. Bolstered by the emphatic response to the Legacy Fund announcement and community demand, construction of the second-floor dance studio will begin in honor of Clara Noyes. Much is happening at the Ashmun Street theatre. What once was merely old is now historic and alive. Thanks to a multitude of supporters across the Eastern Upper Peninsula, a Legacy of the arts will be ensured for generations to come. Donate to the Legacy Fund today! 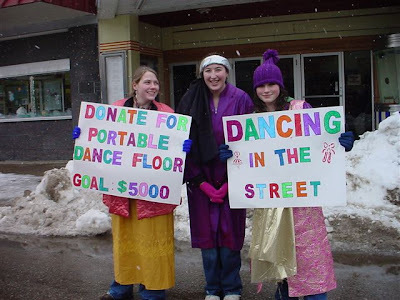 Standing in front of the Soo Theatre last Friday, STARS dance students (above) try to get the attention of Ashmun Street travelers to publicize their campaign to raise money for a portable dance floor. To date the students have received $800 in donations toward the estimated cost of $5000. STARS dance students' Annual Revue at the LSSU Performing Arts Center takes place in mid-May, and the girls hope to be able to purchase the portable floor in time for that event. "The portable dance floor will provide a safer surface for the students to perform on," said STARS dance instructor, Dianna George. "Neither stage surface at LSSU or in the Soo Theatre was specifically built as a dance surface," she explained. If you'd like to contribute to this project, you can stop in at 534 Ashmun between the hours of 10 a.m. and 8 p.m. or send a check to the Soo Theatre Project denoting "dance floor" in the memo space. For more news on the students' fundraising efforts, see the STARS website. Below, from a STARS window, young ballet students watch their idols, the older ballerinas, dancing in the street in front of the Soo Theatre. Photos in this posting courtesy of Meta Geyer. The Soo Theater Project has set South Pacific auditions for Sunday, April 6th from 3:00-5:00PM and Monday, April 7th from 6:30-8:30 at the Soo Theater on Ashmun Street in Sault Ste. Marie, Michigan. 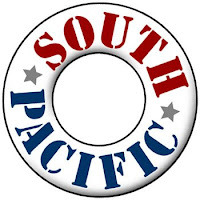 After holding a cattle call in February for all males who sing, the Soo Theater Project has decided to continue with production plans for the Rodgers and Hammerstein award-winning musical, South Pacific, scheduling August 7th thru the 10th performances. “More than a dozen strong singers showed up, and several others called in expressing interest. Now we know we can find enough guys to do this show right”, declared director Dave Rhinard. The show, based on James Michener’s Pulitzer Prize-winning novel, Tales of the South Pacific, revolves around American soldiers who are stationed on an island during WWII. All roles for both genders are open, including the four lead singers: Emile, the French plantation owner; Nellie, the American nurse; Bloody Mary, a Tonkinese con-artist; and Lieutenant Joe Cable. A large singing ensemble with numerous small roles for men and women is also required. Musical director Karen Hughes has requested that all persons interested in a leading or supporting role prepare one verse of a Broadway show tune for the audition. Small groups of two or three may be asked to read a short scene, try an accent, or even sight-read part of an additional song. For more information, or to reserve an audition time slot, call the Soo Theater at (906) 632-1930.